Bollinger Bands are technical indicator developed by John Bollinger during the 1980’s and most thoroughly explained in his 2001 book ‘Bollinger on Bollinger Bands’. Bollinger bands are volatility indicator similar and can be used to measure the ‘highness’ or ‘lowness’ of an instruments price relative to previous closes. This particular indicator involves overlying three bands (lines) on top of either bar or candlestick chart. The central line or band can be either a simple moving average or alternatively an exponential moving average. However calculating the central band using a simple moving average tends to be the more popular choice among traders. The upper and lower bands are the running standard deviations from the central moving average. Due to the fact that standard deviations are themselves a measure of volatility, Bollinger bands are self-adjusting widening during periods of high volatility and contracting during periods of low market volatility. John Bollinger himself recommends using 10-day bands for short term trading, 20 days for intermediate-term trading and finally 50 day bands for long term trading. However, these quoted values are intended to apply to Stocks and bond, meaning that many currency and commodity traders may want to use shorter time frames. 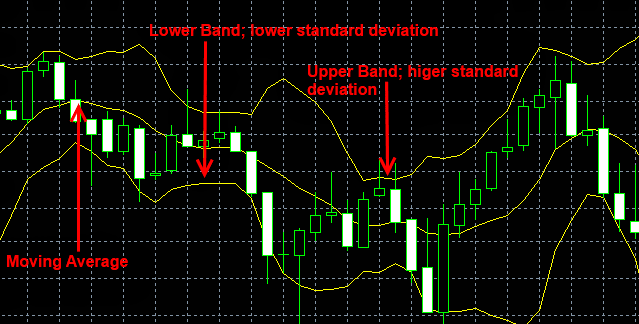 When setting up Bollinger bands, traders are typically required two enter in two different parameters the time frame (as mentioned above) and the number of standard deviations to plot above and below the central Bollinger band. Statistically analysis suggests that around 95% of all daily closes will fall within three standard deviations of the mean. Typically traders opt with between 1.5 to 2.5 standard deviations of the central Bollinger band. 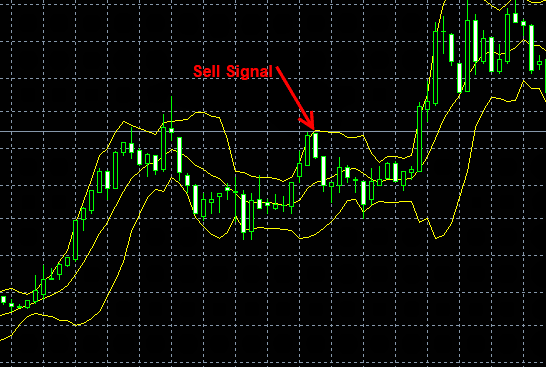 A Buy Signal, when the price touches the lower Bollinger band with a plan to exit when price touches the moving average in the center. A Sell Signal, when the price touches the upper band with a plan to exit when the price touches the moving average the in the center. 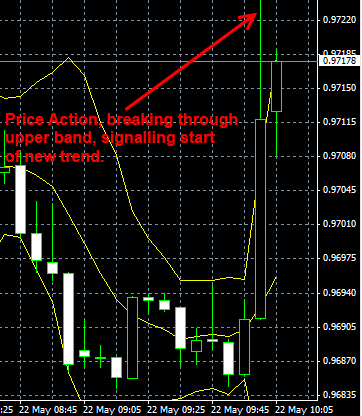 As a Buy or Sell signal, when the price action breaks through the upper or lower Bollinger bands. Bollinger bands have been used by option traders, who sell Options when Bollinger bands are historically wide apart and buy options when Bollinger Bands are historically close together. Bollinger bands, however are rarely used on their own and are more commonly used alongside other indicators, wit Bollinger bands commonly being used alongside the RSI (Relative Strength Index). It is generally required to use Bollinger Bands alongside another technical indicator, as the ambiguity associated with interpretation of the indicator can lead to false signals. Thus Bollinger Bands shouldn’t be used on their own, as the use of other technical indicators is required to confirm price action.